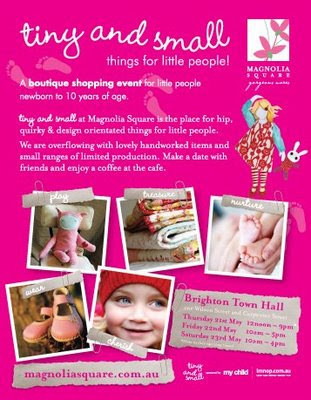 • tomorrow is the big day, the first of three i'll be selling my wares at the magnolia square tiny & small event at brighton town hall. in case you can't read the miniscule type above, the market runs from noon until 9pm thursday, 10am until 5pm friday and 10am until 4pm saturday. there are lots of lovely wares there besides mine (you can check out the full list of vendors here) and some of the best damn cupcakes i've ever tasted (i highly recommend the chocolate mud and the carrot cake ones) so come on over for a browse. • onegirl designwrks was featured on the LMNOP blog today! in case you haven't heard of it, LMNOP is a free quarterly pdf magazine aimed at stylish parents and kids. the photography is always stunning and the products shown are always beyond gorgeous so i'm quite, quite pleased to be featured on their blog. you check out the post on me here. 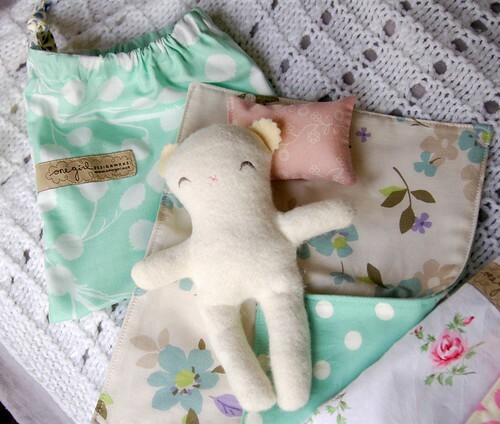 complete with their own reversible quilt and wee pillow, all cozy in a coordinating drawstring pouch. these are crazy fun to make and, at about 17cm tall (7") are also the smallest softie i've ever attempted. i was only able to make five sets for the market but i will be making more for the esty shop update next month. 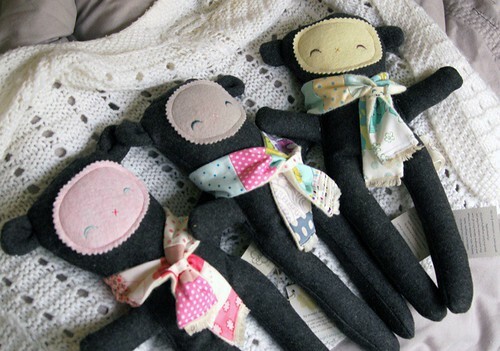 i'm considering offering this set as a pattern as well, it would be a great beginner project and a cute gift, i think. i love them. only five of these cuties available too but i might make more around christmas for the north american winter. okay that's it for me tonight - wish me luck getting all the last minute details finished, like writing notes about mae for the nanny (oh yes, in case anyone was wondering how i solved my child care dilemma, i ended up hiring a great nanny that a friend recommended for the next couple of days. she is lovely and mae digs her so i'm feeling good about it), setting up my stall tomorrow and selling lots of goods at the market!! go girl! good luck. those oobie babies are super dooper alley ooper! All the best- sure it will go wonderfully well as all your wares are gorgeous! I so wish I could come. All the best, not that I think you'll need it. Can't wait to hear all about it. I'm probably coming down on Friday morning so I'll pop in and say 'Hello' - good luck. Oh my god! The cuteness! And the nanny? SUCH a good idea. Love the baby oobees - good idea!! Ooh those winter oobees are just so delightful. I could imagine one in my house so I do hope you make some more of them. I wish I could make it to the market too but I think I am going to be without the car on Saturday, but if I keep my fingers crossed just maybe! Those baby oobees are gorgeous. 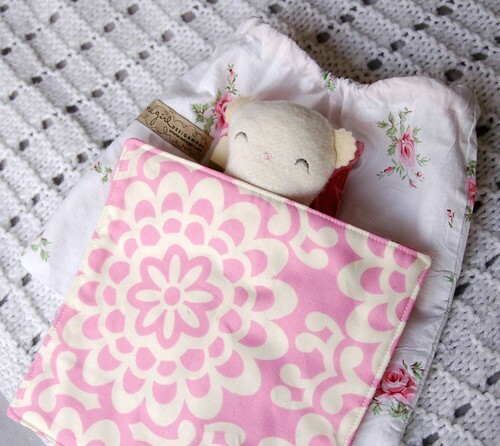 You must have loads of that Amy Butler wallflower fabric in pink! Leslie, you don't need luck for the market with such amazing work. Have a great time and see you there! Best of luck, though looking at your photos I don't think you will need it! If only I lived in Brighton. congratulations on the markets and lmnop (its such a great zine), those baby oobees are just so sweet. I love them. Oh good luck at the market. Our neighbour when we lived up in the hills was friends with the lady from Crabapple so he would drop of trays of the cupcakes. Oh boy, they are GOOD. I think the chocolate orange one was my favourite. The babes are gorgeous - all your marketty goodness looks fabulous. These are my favorite products of yours yet, I love them! Congrats, congrats on the LMNOP feature, it's great! love the baby oobees! they are very sweet. The baby oobees are so cute! I'd definitely buy the pattern. Well you threw me with the new posting - I don't learn new skills quickly! Everything looks gorgeous, as per usual and I'm sure you'll do well. I wish I could say I'd get there, but those are my work days and we're away next weekend. I love the new little little guys - we have so few babes left on our friend horizon, although there is one in September, a 4th for friends, so I'll keep my eyes on the etsy shop. As you already must know, these are fabulous. What an awesome idea!